SUGANUMA Morito is a student of Nobuyoshi Tamura and Ueshiba. SUGANUMA Morito was born in 1942. He was the Uchideshi of Master UESHIBA Morihei and currently owns an 8th dan Aikikai. 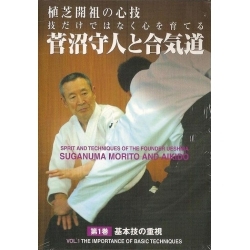 This DVD is the last volume of "SUGANUMA Morito and Aikido (SUGANUMA Morito to Aikido)" which is a series of "The Spirit and Technique of Master UESHIBA". It shows advanced movements and explains how to develop the mental aspect to improve one's Aikido skills.